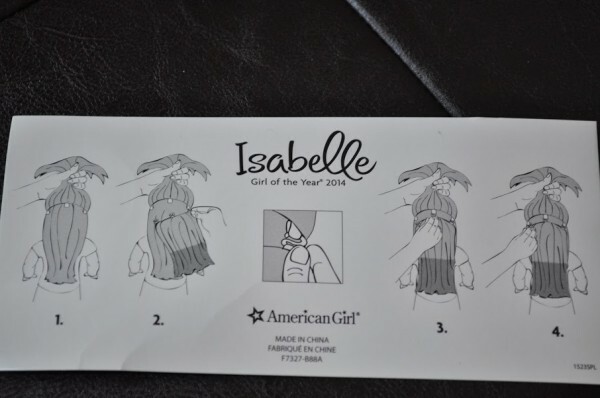 Kenzie and I are so excited to finally get our hands on Isabelle, the American Girl Doll of the year 2014. You can check out all the scoop below for our Isabelle American Girl of the Year 2014 Video Review and up close photos. Girls who are involved in dance or who love fashion trends will find Isabelle especially appealing as she is a dancer and loves to design her own outfits. Our favorite feature of Isabelle is definitely her Pink Tipped highlights which are included with your doll but are a removable feature for her hair. Very cool and different than anything we’ve ever seen from American Girl. 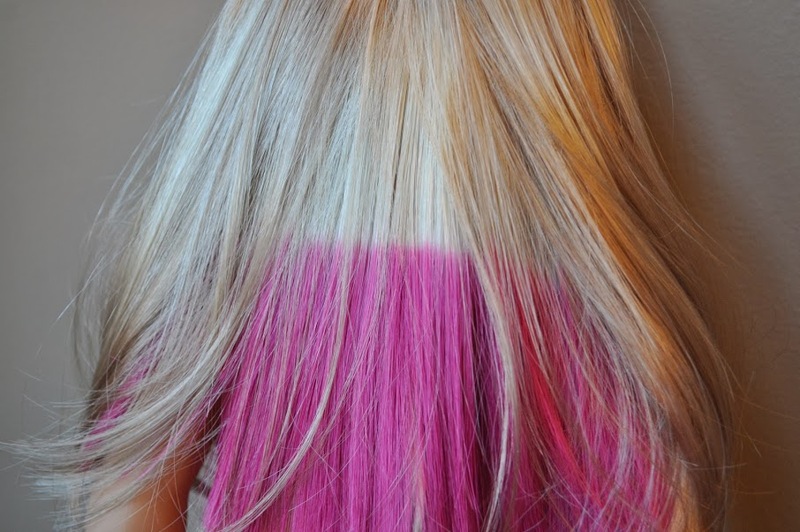 You can see photos below in our post and video showing just how to insert her pink highlights into her hair as well. Take a peek at our video review of Isabelle for a real live look at her. 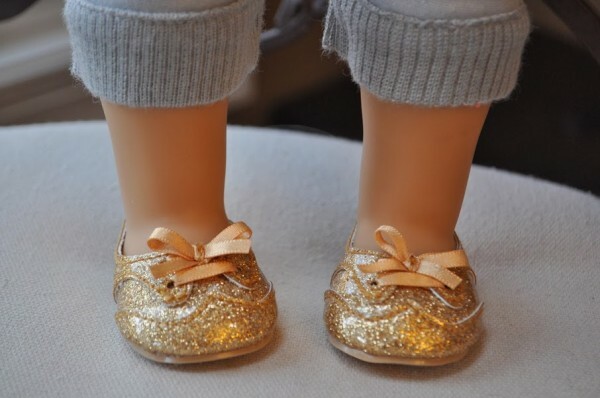 Isabelle arrives in adorable cropped sparkly jeans and gold glitter shoes. So cute! She is always wearing an adorable pink asymmetrical tee that is embellished with a ballerina. Kenzie, my 8 year old, especially felt connected to this tee as she said Isabelle wears it in the book and it is Isabelle’ absolute FAVORITE shirt. Cute! Look at this super sweet hair twists in Isabelle’s hair. There are hair twists on BOTH sides that keep her hair out of her face. They look very cute and obviously are very practical for Isabelle’s dance practices! You could take these out if you wanted, but we plan to keep them in as they look so sweet and are done perfectly. 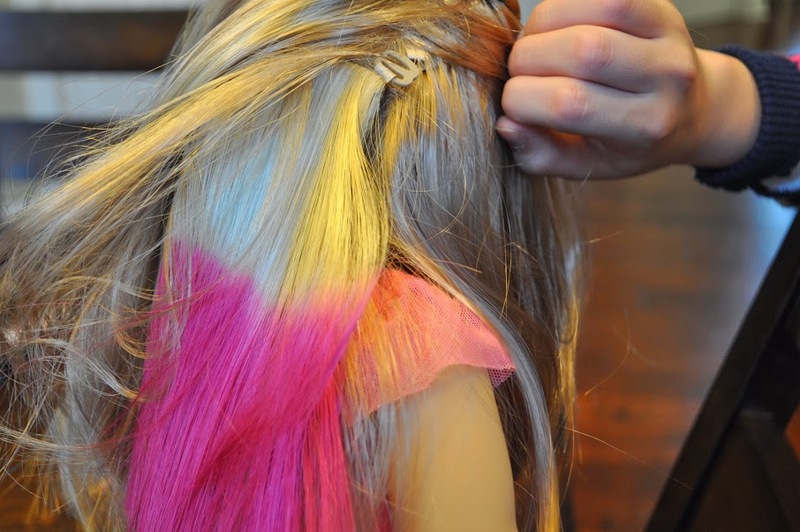 I doubt this Mama could do them pretty as the staff at American Girl’s Hair Salons! You can show as much or as little of Isabelle’s pink extensions depending on how you part her hair in the back or if she wears it over her shoulders or not. 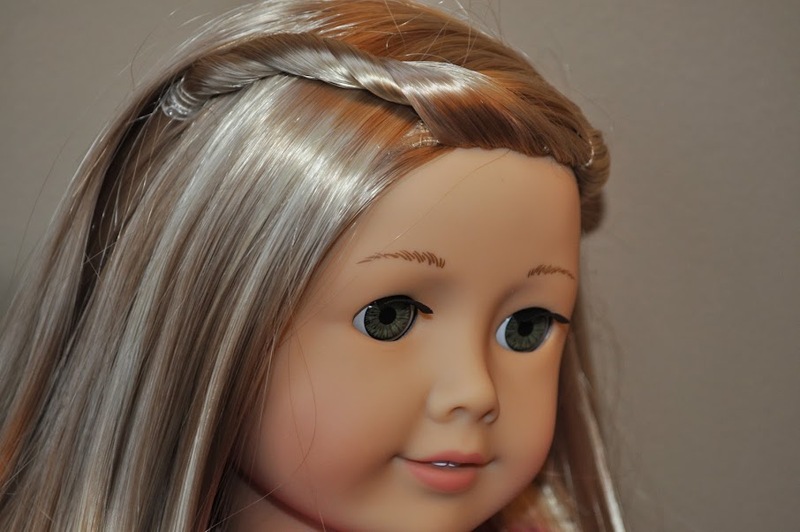 The detailed instructions come with the doll and are super easy to use. The only tricky part is that it is helpful to have 2 people putting her hair extensions in at once since you need to separate out Isabelle’s permanent hair so you can easily find the placeholders for the hooks that will connect to her pink hair extensions. You can do this alone, we just found it easier if there were two of us doing it so we didn’t make her adorable hairstyle too messy in the process! Kenzie is ADORING Isabelle as you can imagine – especially after falling in love with the book as I bought it for her when it was released – so she was bsuy reading it on New Year’s Day. There is a total of 3 books in this American Girl DOTY 2014 series which is very exciting for our young readers since often there is only 2 books. Kenize is OBSESSED with these Girl of the Year books. The stories are so wonderful for little girls that as a Mom I think this is way we are so willing to spend the bucks on AG goodies since the messaging of American Girl is so wholesome. 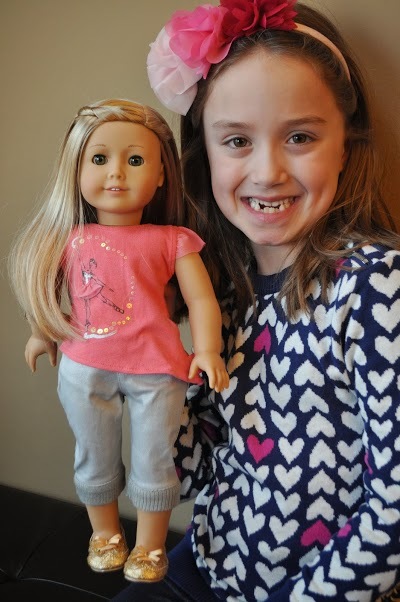 I just love everything American Girl as far as the stories go as I love a tale that will teach my daughter about friendship, determination, and how to pursue your passions. Here is the official synopsis of Isabelle’s story from American Girl directly. Written by award-winning author Laurence Yep, the 2014 Girl of the Year® books―Isabelle, Designs by Isabelle, and To the Stars, Isabelle―introduce readers to Isabelle Palmer, a talented ten-year-old girl who loves to dance and to design ballet costumes. When she starts attending the Anna Hart School of the Arts, Isabelle has a hard time getting her proper footing—both in her transition to a new school and in the dance studio. To complicate the situation, her older sister, Jade, is the star ballerina at the school, and a rival classmate tries to make Isabelle feel as if she doesn’t belong there. Isabelle struggles with self-doubt, but when she stops comparing herself to others and learns to focus on her own unique talents, she finds a special way to stand out and to use her passions to help others, too. 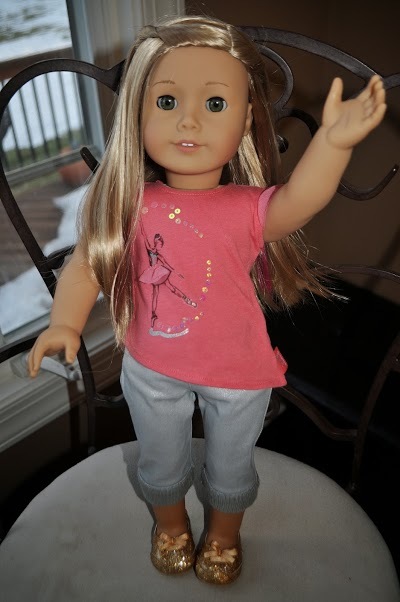 Note: Thanks to American Girl for sending us this sample to facilitate our featured reviews. As always, all thoughts and opinions are our own. Oh what a nice doll, every young girl’s dream ! I love it, I love it so much that the greedy gnome in me wants more ! As a boy mom I kind of giggle at the fascination with these dolls, but I so get it! The girls are crazy about them and this one is really cute. Love that she can have pink hair so fun! My girls aren’t in to American Girl yet but I also can’t wait to take them to NYC one day for a special trip when they’re old enough!